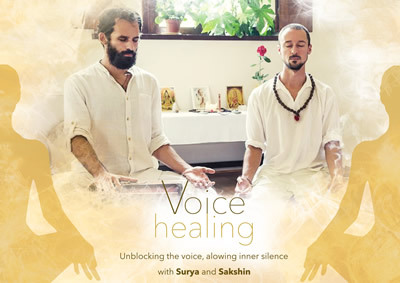 Sakshin guides voice exercises to open the voice and energy channel. Surya accompanies with chakra sound and intuitive singing around a specific theme. This was very powerful in the Silence & Sound retreat! Sakshin and Surya met in January 2017 in India, where they played music together for Sri Prem Baba. The connection, both musically and personally, they felt during that time was a seed that sprouted soon into a warm friendship and close collaboration. Since that time they were teaching and playing together in both Belgium and Spain. In the evening, Surya & Sakshin will be playing a Shamanic Mantra concert.